Take this Waltz is a film which makes no solid decisions, doesn’t moralise, and won’t attempt to solve any of your problems. Directed by Sarah Polley, instead, it aims to break the cycle of cliché, and sticks as close to reality as possible. Much like life, there are no real resolutions, the characters are flawed, and you walk away not really knowing whose side you should come down on. Margot (Michelle Williams) is a writer who doesn’t write the things she wants to and has been married to Lou (Seth Rogan) for five years. Their relationship has devolved into one that is almost reminiscent of siblings; they have no children, no pets and Lou would rather cook chicken than respond to Margot’s sexual advances. When she meets her neighbour Daniel (Luke Kirby), an artist and rickshaw driver, she begins to debate whether her attraction to the new is worth throwing away the old. Many people won’t like this film. It is not classic Hollywood. If it were, it would be a lot more black and white. Margot would meet Daniel and quash her feelings as best as possible. However Lou, who would be an angry and unappreciative tool, would lose his temper, almost backhand her, and thus send her running into the arms of Daniel, a charming and sensitive young man. Credits would roll over a loving gaze and hands entangled. However, this film is entirely made up of shades of grey. Daniel, though sensitive, is also awkward, almost rudely blunt, and at times a bit of a jerk. The relationship between Margot and Lou is close but strained. They constantly tell each other “I love you” along with a string of in-jokes, and often descend into speaking in baby talk, something which made me want to vomit into a bucket of rainbows. It’s hard to pinpoint what exactly is wrong with them. Lou is sweet, if somewhat oblivious. When the topic of children does come up, he is unenthused, wanting to push it at least six years into the future. It’s hard to blame him; Margot acts more like a child than an adult. In one scene she demands attention and giggles while Lou is on a business call, in another she calls Daniel “Gaylord” when he says he likes to go to the lake before work. The building tension between Margot and Daniel is portrayed well, though it sometimes accelerates unnaturally abruptly. Playing with the option is initially fun and distant, and she continues flirting despite the warning that “new things get old too” that she receives following a swim dance class. Eventually the line she’s walking becomes so narrow that she’s pushed towards a decision. 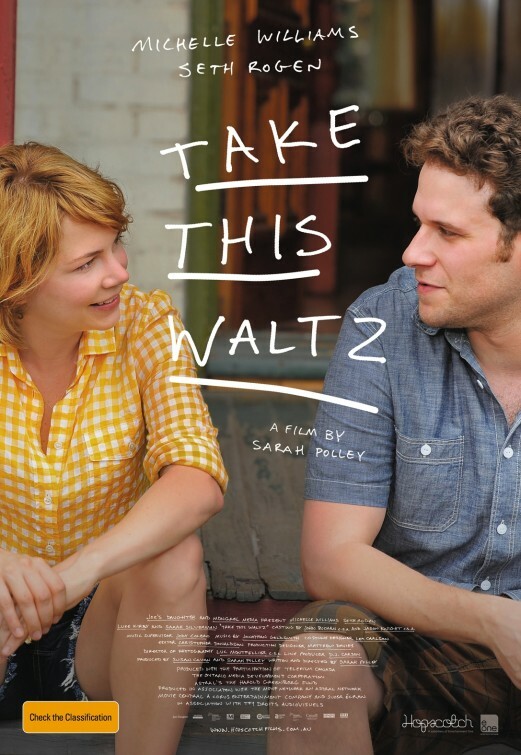 Take this Waltz isn’t a commentary on adultery or relationships. The strength of this film lies in its simple complexity. It doesn’t try to resolve life’s problems – merely depict them. Where other movies would have cut, leaving viewers to happy uncertainty, it pushes past, highlighting human faults, inevitable cycles and essentially ends up coming across as just a snapshot out of someone’s life. This entry was posted in Film, Reviews and tagged Luke Kirby, Michelle Williams, Sarah Polley, Sarah Silverman, Seth Rogan, Take this Waltz, Video Killed the Radio Star. Bookmark the permalink.